"Steinway" redirects here. For other uses, see Steinway (disambiguation). Steinway & Sons, also known as Steinway, (/ˈstaɪnweɪ/ ( listen)) is an American-German piano company, founded in 1853 in Manhattan by German piano builder Heinrich Engelhard Steinweg (later known as Henry E. Steinway). The company's growth led to the opening of a factory in New York City, United States, and a factory in Hamburg, Germany. The factory in the Queens borough of New York City supplies the Americas and the factory in Hamburg supplies the rest of the world. Along with C. Bechstein, Bösendorfer and Blüthner, Steinway is frequently referred to as one of the "Big Four" piano manufacturers. Steinway has been described as a prominent piano company, known for making pianos of high quality and for inventions within the area of piano development. Steinway has been granted 126 patents in piano making; the first in 1857. The company's share of the high-end grand piano market consistently exceeds 80 percent. The dominant position has been criticized, with some musicians and writers arguing that it has blocked innovation and led to a homogenization of the sound favored by pianists. Steinway pianos have received numerous awards. One of the first is a gold medal in 1855 at the American Institute Fair at the New York Crystal Palace. From 1855 to 1862, Steinway pianos received 35 gold medals. More awards and recognitions followed, including three medals at the International Exposition of 1867 in Paris. The European part of the company holds a royal warrant of appointment to Queen Elizabeth II. In addition to the flagship Steinway piano line, Steinway markets two other, lower priced brands of piano sold under the secondary brand names Boston and Essex. The Boston brand is for the mid-level market and the Essex brand is for the entry-level market. Boston and Essex pianos are designed by Steinway engineers and produced in Asia at other piano makers' factories under the supervision of Steinway employees to utilize a lower cost of parts, production, and labor. Heinrich Engelhard Steinweg first made pianos in the 1820s from his house in Seesen, Germany. He made pianos under the Steinweg brand until he emigrated from Germany to America in 1850 with his wife and eight of his nine children. The eldest son, C. F. Theodor Steinweg, remained in Germany, and continued making the Steinweg brand of pianos, partnering with Friedrich Grotrian, a piano dealer, from 1856 to 1865. In 1853, Heinrich Engelhard Steinweg founded Steinway & Sons. His first workshop in America was in a small loft at the back of 85 Varick Street in the borough of Manhattan in New York City. The first piano made by Steinway & Sons was given the number 483 because Heinrich Engelhard Steinweg had built 482 pianos in Germany. Number 483 was sold to a New York family for $500, and is now on display at the German museum Städtisches Museum Seesen in Seesen, the town in which Heinrich Engelhard Steinweg began his career as a piano maker. A year later, demand was such that the company moved to larger premises at 82–88 Walker Street. It was not until 1864 that the family anglicized their name from Steinweg to Steinway. By the 1860s, Steinway had built a new factory at Park Avenue between 52nd and 53rd Street (the present site of the Seagram Building) where it covered a whole block. With a workforce of 350 men, production increased from 500 to nearly 1,800 pianos per year. The employees were mostly German immigrants and the official language of the company was German. The pianos themselves underwent numerous substantial improvements through innovations made both at the Steinway factory and elsewhere in the industry based on emerging engineering and scientific research, including developments in the understanding of acoustics. Almost half of the company's 126 patented inventions were developed by the first and second generations of the Steinway family. Steinway's pianos won prizes at exhibitions in New York City, London, and Paris. By 1862, Steinway pianos had received more than 35 medals. Part of Steinway's early reputation arose from its successes in trade fairs. In 1865, the Steinway family sent a letter to C. F. Theodor Steinweg asking that he leave the German Steinweg factory (by now located in Braunschweig (Brunswick)) and travel to New York City to take over the leadership of the family firm due to the deaths of his brothers Henry and Charles from disease. C. F. Theodor Steinweg obeyed, selling his share of the German piano company to his partner, Wilhelm Grotrian (son of Friedrich Grotrian), and two other workmen, Adolph Helfferich and H.G.W. Schulz. The German factory changed its name from C. F. Theodor Steinweg to Grotrian, Helfferich, Schulz, Th. Steinweg Nachf. (English: Grotrian, Helfferich, Schulz, successors to Th. Steinweg), later shortened to Grotrian-Steinweg. In New York City, C. F. Theodor Steinweg anglicized his name to C. F. Theodore Steinway. During the next 15 years of his leadership, he kept a home in Braunschweig and traveled often between Germany and the United States. Around 1870–80, William Steinway (born Wilhelm Steinweg, a son of Heinrich Engelhard Steinweg) established a professional community, the company town Steinway Village, in what is now the Astoria neighborhood of Queens in New York City. Steinway Village was built as its own town, and included a new factory (still used today) with its own foundry and sawmill, houses for employees, kindergarten, lending library, post office, volunteer fire department, and parks. Steinway Village later became part of Long Island City. Steinway Street, one of the major streets in the Astoria and Long Island City neighborhoods of Queens, is named after the company. In 1876, Steinway participated in the Centennial Exposition in Philadelphia. The competition was principally between Steinway, Chickering, and Weber. According to journalist James Barron's account of Steinway's participation in the competition, the company was able to secure success by bribing one of the judges. William Steinway denied to the exposition's organizers that a judge had been paid directly, although Barron states that the judge was bribed through an intermediary: the pianist Frederic Boscovitz. According to freelancer Isabel Wolff, William Steinway would admit in his diary that under his leadership the New York City arm of the company bribed judges at trade fairs to favor Steinway pianos. According to musicologist Donald W. Fostle, it is untrue that Steinway repeatedly bribed judges at trade fairs, and in the one documented case it is unclear if Steinway were enmeshed, along with others, in bribery or were the target of attempted extortion. To reach European customers who wanted Steinway pianos, and to avoid high European import taxes, William Steinway and C. F. Theodore Steinway established a new piano factory in the free German city of Hamburg in 1880. The first address of Steinway's factory in Hamburg was at Schanzenstraße in the western part of Hamburg, St. Pauli. C. F. Theodore Steinway became the head of the German factory, and William Steinway went back to the factory in Queens. The Hamburg and Queens factories regularly exchanged experience about their patents and technique despite the large distance between them, and they continue to do so today. C. F. Theodore Steinway was a talented inventor who made many improvements in the construction of the piano. More than a third of Steinway's patented inventions are under the name of C. F. Theodore Steinway. The Steinway factory in Hamburg was part laboratory, part factory. Much of the precision cutting and drilling machinery installed in the Queens factory was tried in the Hamburg factory first. C. F. Theodore Steinway died in Braunschweig in 1889, having successfully competed against the Grotrian-Steinweg brand – both the Hamburg-based Steinway factory and the Braunschweig-based Grotrian-Steinweg factory became known for making premium German pianos. Meanwhile, the 1880s saw the company embroiled in a series of labor disputes between the New York City factory and its workers. Back then, industrialists faced labor strikes frequently. One dispute, in 1880, saw the company lead an industry-wide lockout of piano workers in New York City. In later disputes in the decade, the company hired detectives to spy on its workers, paid police for their backing and protection of company property, and evicted strike leaders from company housing. In 1883, the Hungarian composer and pianist Franz Liszt wrote in a letter to Steinway: "...The new Steinway grand is a glorious masterpiece in power, sonority, singing quality, and perfect harmonic effects, affording delight even to my old piano-weary fingers. Ever continuing success remains a beautiful attribute of the world-renowned firm of Steinway & Sons. ...Owing to my ignorance of the mechanism of piano construction I can but praise the magnificent result in the volume and quality of sound." In 1890, Steinway received its first royal warrant, granted by Queen Victoria. The following year the patrons of Steinway included the Prince of Wales and other members of the monarchy and nobility. In subsequent years Steinway was granted royal and imperial warrants from the rulers of Italy, Norway, Persia, Portugal, Romania, Russia, Spain, Sweden, and Turkey. From 1864 to 1866, William Steinway, who is credited with establishing Steinway's success in marketing, oversaw the construction of Steinway Hall on East 14th Street in Manhattan, New York City. Steinway Hall had cost $200,000 to build. It included the second largest concert hall in New York City as well as showrooms for Steinway pianos. To enter the concert hall concertgoers had to pass through the showrooms, a way to advertise Steinway pianos. Sales increased by more than 400 pianos in 1867. Steinway Hall quickly became one of New York City's most prominent cultural centers, housing the New York Philharmonic for the next 25 years until Carnegie Hall opened in 1891. In 1925, the Steinway Hall on East 14th Street was closed and a new Steinway Hall on West 57th Street was opened. In 2013, Steinway sold the Steinway Hall on West 57th Street for $46 million and moved out of the building at the end of 2014. In 2016, a new Steinway Hall opened on Sixth Avenue. A second Steinway Hall was opened in London in 1875. It was located first on Wigmore Street, in 1924 it moved to St. George Street, and later it moved to its current address on Marylebone Lane. In 1857, Steinway began to make a line of art case pianos, designed by artists. In 1903, the 100,000th Steinway grand piano was given as a gift to the White House; it was decorated by the artist Thomas Wilmer Dewing. The 100,000th Steinway grand piano was replaced in 1938 by the 300,000th, which remains in use in the White House. The piano is normally placed in the largest room of the White House, the East Room. Harold Bauer playing Saint-Saëns' Piano Concerto No. 2 in G minor, Op. 22, excerpt of 3rd movement. Duo-Art recording 5973-4 played on a Steinway grand piano model XR 6'2" Duo-Art from 1920. Later, Steinway diversified into the manufacture of player pianos. Several systems such as the Welte-Mignon, Duo-Art, and Ampico were incorporated. During the 1920s, Steinway had been selling up to 6,000 pianos a year. In 1929, Steinway constructed one double-keyboard grand piano. It has 164 keys and 4 pedals. (In 2005, Steinway refurbished this instrument). During World War II, the Steinway factory in Queens received orders from the Allied Armies to build wooden gliders to convey troops behind enemy lines. Steinway could make few normal pianos, but built 2,436 special models called the Victory Vertical or G.I. Piano. It was a small piano that four men could lift, painted olive drab, gray, or blue, designed to be carried aboard ships or dropped by parachute from an airplane to bring music to the soldiers. The factory in Hamburg, Germany, could sell very few pianos during World War II. No more than a hundred pianos per year left the factory. In the later years of the war, the company was ordered to give up all the prepared and dried wood their lumber yard held for war production. In an air raid over Hamburg, several Allied bombs hit the factory and nearly destroyed it. After the war, Steinway restored the Hamburg factory with help from the Marshall Plan. In the late 1960s, Steinway brought countersuit against Grotrian-Steinweg to stop them from using the name Steinweg on their pianos. Steinway won the case on appeal in 1975, forcing their competitor to use only the name Grotrian in the United States. The case set a precedent and established the concept of Initial Interest Confusion, in which consumers might be initially attracted to a similarly named but lesser-known brand because of the stronger brand's good reputation. In 1972, after a lengthy strike, a long-running financial struggle, high legal expenses, and a lack of business interest among some of the Steinway family members, the firm was sold to CBS. At that time CBS owned many enterprises in the entertainment industry, including electric guitar and amplifier maker Fender, drum maker Rogers, electro-mechanical piano maker Rhodes, and the baseball team New York Yankees. CBS had plans to form a musical conglomerate that made and sold music in all forms and through all outlets, including records, radio, television, and musical instruments. This new conglomerate was evidently not as successful as CBS had expected, and Steinway was sold in 1985, along with classical and church organ maker Rodgers and flute and piccolo maker Gemeinhardt, to a group of Boston-area investors. In order to acquire Steinway, the investors founded the musical conglomerate Steinway Musical Properties. In 1995, Steinway Musical Properties merged with the Selmer Company to form the musical conglomerate Steinway Musical Instruments, which was named Company of the Year in 1996 by The Music Trades: "As the industry's most recognized trademark Steinway & Sons is synonymous with piano quality worldwide ... Steinway's success has been hard-won on the factory floors in Long Island City and Hamburg, Germany, and on retail showrooms around the world." The award was given in recognition of Steinway's "overall performance, quality, value-added products, a well-executed promotional program and disciplined distribution which generated the most impressive results in the entire music industry." Steinway Musical Instruments acquired the flute manufacturer Emerson in 1997, the piano keyboard maker Kluge in 1998, and the Steinway Hall in Manhattan in 1999. The conglomerate made more acquisitions in the following years. From 1996 to 2013, Steinway Musical Instruments was traded at the New York Stock Exchange (NYSE) under the abbreviation LVB, for Ludwig van Beethoven. In 1988, Steinway made its 500,000th piano. Designed by artist Wendell Castle, it carries inscriptions of the names of the 832 pianists and 90 ensembles on the Steinway Artist roster of 1987, including Van Cliburn, Vladimir Horowitz and Billy Joel. Six year later the company launched C. F. Theodore Steinway Academy for Concert Technicians, known simply as Steinway Academy, at Steinway's factory in Hamburg, Germany. There, experienced piano tuners and piano technicians from all over the world receive further training in piano tuning and maintenance. By 2000, Steinway had made its 550,000th piano. In 2003, Steinway celebrated its 150th anniversary at Carnegie Hall with a three-day concert series with performances by Peter Cincotti, Art Garfunkel, Herbie Hancock, Ben Heppner, Ahmad Jamal, Ramsey Lewis, Randy Newman, Roger Williams, Nancy Wilson, and Eroica Trio, among others. The first concert featured classical music, the second jazz, and the third pop. As part of the 150th anniversary, fashion designer Karl Lagerfeld created a commemorative Steinway limited edition grand piano. In 2005, Steinway celebrated the 125th anniversary of the establishment of its factory in Hamburg, Germany. The celebration featured a concert at the Laeiszhalle concert hall in Hamburg with performances by Vladimir and Vovka Ashkenazy, Lang Lang, and Detlef Kraus. 1,800 people from 33 countries attended the concert. As part of the celebration, a 125th anniversary Steinway limited edition grand piano was designed by Count Albrecht von Goertz. Until his death on September 18, 2008 at the age of 93, Henry Z. Steinway, the great-grandson of the Steinway founder, still worked for Steinway and put his signature on custom-made limited edition pianos. At several public occasions, Henry Z. Steinway represented the Steinway family. He started at the company in 1937 after graduating from Harvard University. He was president of the company from 1955 to 1977 and was the last Steinway family member to be president of Steinway. After the 2008 economic downturn, Steinway grand piano sales fell by half, and 30 percent of the union employees were laid off at the Queens factory between August 2008 and November 2009. Sales were down 21 percent in 2009 in the United States. But sales began increasing a little in 2010, and they continued to improve the following year. In June 2013, private equity firm Kohlberg & Company offered to buy Steinway parent company Steinway Musical Instruments for $438 million. Two months later hedge fund Paulson & Co. Inc. made a higher offer, $512 million, to take the company private. The Steinway Musical Instruments board recommended that shareholders accept this, and in September 2013 Paulson announced completion of the acquisition. In 2015, Steinway went back to the player piano industry from around the 1920s by introducing a digital player piano series called Spirio. The technology in the Spirio pianos was created in 2007 by Wayne Stahnke, an Austrian engineer who has previously made digital player piano systems for other piano companies, like Yamaha and Bösendorfer. Wayne Stahnke's technology, originally called Live Performance Model LX, was sold to Steinway in 2014 and re-branded as Spirio. In contrast to player pianos by other brands, a recording option is not available in Steinway Spirio pianos. Later in 2015, Steinway made its 600,000th piano. The piano features the Fibonacci spiral and Macassar ebony veneer. It took 6,000 hours of work over 4 years to make the piano. It was priced at $2.4 million. As of early 2019, Paulson & Co. Inc. remains the ultimate parent of Steinway & Sons., with head office at 1251 Avenue of the Americas, New York, NY 10020. Steinway pianos are sold by a worldwide network of around 200 authorized Steinway dealers who operate around 300 showrooms. Steinway's factory in Hamburg makes seven models of grand piano and two models of upright piano. 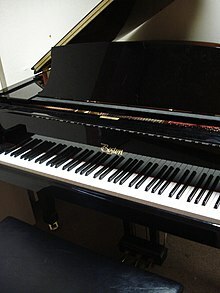 (The numerical portion of the model designations represent the length of the grand pianos and the height of the upright pianos in centimetres). Steinway's factory in Queens makes six models of grand piano and three models of upright piano. Designers and artists such as Karl Lagerfeld, Louis Comfort Tiffany, and Sir Lawrence Alma-Tadema have created original designs for Steinway pianos. These specially designed pianos fall under the art case piano line or the limited edition piano line. Steinway began creating art case pianos in 1857 and the making of art case pianos reached its peak in the late 19th century. Today, Steinway only builds art case pianos on rare occasions. The art case pianos are unique, because Steinway builds only one of each. Some of Steinway's most notable art case pianos are the Alma-Tadema grand piano from 1887, the 100,000th Steinway piano from 1903, the 300,000th Steinway piano from 1938, and the Sound of Harmony from 2008. The Alma-Tadema grand piano was designed by Sir Lawrence Alma-Tadema and received great public acclaim when it was exhibited in London. The piano is made of ebony, inlaid with ivory and mother of pearl, with carved case, lid, and legs, and painted in the inside lid by artist Edward Poynter. It was bought by financier Henry Gurdon Marquand for his New York City mansion. In 1997, it was sold at Christie's auction house in London for $1.2 million, setting a price record for a piano sold at auction. It is now on display at the art museum Clark Art Institute. 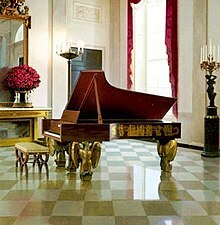 The 100,000th Steinway piano was given as a gift to the White House in 1903 and is made of cherry tree with gold leaf. It is decorated with coats of arms of the thirteen original states of America and painted by Thomas Dewing with dancing figures representing the nine Muses. The 100,000th Steinway piano was replaced in 1938 by the 300,000th Steinway piano. The gold gilded mahogany legs of the 300,000th piano are carved as eagles and are moulded by sculptor Albert Stewart. The piano remains in use in the White House. The Sound of Harmony is decorated with inlays of 40 different woods, including the lid, which replicates artwork by Chinese painter Shi Qi. It took about four years to build the grand piano and it was priced at €1.2 million. The piano was chosen for use at the Expo 2010 Shanghai China. Examples of limited edition pianos include The S.L.ED by Karl Lagerfeld created to celebrate the 150th anniversary of the Steinway company in 2003, and the 125th anniversary grand piano by Count Albrecht von Goertz designed to celebrate the 125th anniversary in 2005 of the foundation of the Steinway factory in Hamburg, Germany. In 1999, Steinway introduced a new line of specially designed pianos, the Steinway Crown Jewel Collection. The collection consists of grand and upright pianos in Steinway's traditional design, but instead of the traditional ebony finish the pianos of the Steinway Crown Jewel Collection are made in veneers of rare woods from around the world. The collection contains wood veneers such as Macassar ebony, East Indian rosewood, and kewazinga bubinga. In addition to the Steinway & Sons brand, Steinway markets two other brands: Boston for the mid-level market and Essex for the entry-level market. Boston and Essex pianos are made using lower-cost components and labor. Pianos of these two brands, made with Steinway owned designs, are manufactured in Asia by suppliers. Steinway allows only its authorized Steinway dealers to carry new Boston and Essex pianos. Boston: made for the general mid-ranged piano market at lower prices than Steinway's name brand. Boston pianos are manufactured at the Kawai piano factory in Hamamatsu, Japan. There are five sizes of Boston grands and three sizes of Boston uprights available in a variety of finishes. Grand piano models are GP-156 PE, GP-163 PE, GP-178 PE, GP-193 PE, and GP-215 PE. Upright piano models are UP-118 PE, UP-126 PE, and UP-132 PE. Boston pianos incorporate some of the features of Steinway pianos such as a wider tail design (a feature of the Steinway piano models A-188, B-211, C-227, and D-274) resulting in a larger soundboard area than conventionally shaped pianos of comparable sizes, a maple inner rim, and Steinway's Hexagrip pinblock. Essex: made for the entry-range market and is lower priced than Steinway and Boston pianos. Since 2005, Essex pianos are made at the Pearl River piano factory in Guangzhou, China. Prior to 2005, they were made by Young Chang in Korea. There are two sizes of Essex grands and four sizes of Essex uprights available in a wide variety of finishes and furniture designs. Grand piano models are EGP-155 and EGP-173. Upright piano models are EUP-108, EUP-111, EUP-116, and EUP-123. Like the Boston pianos, Essex pianos incorporate some of the features of Steinway pianos as well: a wider tail design, an all-wood action with Steinway geometry with rosette-shaped hammer flanges, and reinforced hammers with metal fasteners. Steinway maintains a worldwide "piano bank" from which performing pianists, especially Steinway Artists, can select a Steinway piano for use in a certain concert, recording, or tour. The idea is to provide a consistent pool of Steinway pianos with various characteristics for performing pianists' individual touch and tonal preferences. Performing artists choose a piano for use at a certain venue after trying some of the pianos of the "piano bank". This allows a range of Steinway pianos with various touch and tonal characteristics to be available for performers to choose from. Steinway takes responsibility for preparing, tuning, and delivering the piano of the performer's choice to the designated concert hall or recording studio. The performer bears the cost of these services. The "piano bank" consists of approximately 300 Steinway pianos valued collectively at $15 million in 2002. Some pianists of the past and some active pianists today have expressed a preference for Steinway pianos made at Steinway's factory in Hamburg, or at Steinway's factory in Queens. Emanuel Ax, concert pianist and piano teacher at the Juilliard School, has said that "... the differences have more to do with individual instruments than with where they were made." Larry Fine, American piano technician and author of The Piano Book, considers Hamburg Steinway pianos to be of a higher quality than Queens Steinway pianos. In 2010, the Steinway factory in Queens made some changes in its manufacturing processes and materials in order to upgrade the quality of the Queens Steinway pianos. Larry Fine was invited by Steinway officials to tour the Queens factory to see some of the manufacturing changes. Fine wrote in his Acoustic & Digital Piano Buyer of Spring 2011 that the changes have improved the quality of Queens Steinway pianos, but that Hamburg Steinway pianos are still of a higher quality than Queens Steinway pianos. The Steinway piano market is divided into two sales areas: the Queens Steinway factory, which supplies North and South America, and the Hamburg Steinway factory, which supplies the rest of the world. At all main Steinway showrooms across the world, customers can order pianos from either factory. The Hamburg and Queens factories exchange parts and craftsmanship, and Steinway parts for both factories come from the same places: Canadian maple is used for the rim, and the soundboards are made from Sitka spruce from Alaska. Both factories use similar crown parameters for their diaphragmatic soundboards. To maintain quality, Steinway has acquired some of its suppliers. Steinway bought the German manufacturer Kluge in Wuppertal, which supplies keyboards, in December 1998, and in November 1999, purchased the company that supplies its cast iron plates, O. S. Kelly Co. in Springfield, Ohio. A majority of the world's concert halls own at least one Steinway piano, and some (for example Carnegie Hall) have model D-274s from both the Hamburg factory and the Queens factory to satisfy a greater range of preferences. Each Steinway grand piano consists of more than 12,000 individual parts. A Steinway piano is handcrafted and takes nearly a year to build. Steinway maintains its own lumber yards at both the Hamburg factory and the Queens factory, aging and drying lumber from nine months to five years. Less than 50 percent is finally used in the making of Steinway pianos. More than 70 percent of the walnut stock is discarded. The woods are purchased when they are available rather than when they are needed. The rim of Hamburg-made Steinway pianos consists of layers of hard rock maple and mahogany and the rim of Queens-made Steinway pianos consists of layers of hard rock maple only. The layers are glued and pressed together into one piece in one operation using rim-bending presses that C. F. Theodore Steinway invented in 1880. After the rim-bending process, the rim has to rest from the stress of being bent. It is placed in a conditioning room for a month or more to reduce the moisture content of the wood to approximately six percent. Inside the Steinway piano, a cast iron plate provides the strength to support the string tension from 16 tons up to 23 tons. The iron plate is installed above the soundboard and is bronzed, lacquered, polished, and decorated with the Steinway logo. Steinway fabricates plates in its own foundry. Steinway makes its soundboard from solid spruce, which allows the soundboard to transmit and amplify sound. The soundboard in Steinway pianos are double-crowned with Steinway's diaphragmatic design. The diaphragmatic soundboard, which was granted a patent in 1936, tapers in thickness from the center to the edges, which permits more freedom of movement resulting in a richer and more lasting tonal response. Steinway bridges are made of vertically laminated hard rock maple with a hard rock maple cap. The bridges are measured for specific height requirements for each piano and are hand notched. Steinway keys are of Bavarian spruce. The surface of the white keys is made of polymer. It was earlier made of elephant ivory. Around the 1950s, Steinway switched from using ivory, and some years later use of ivory for piano keys was outlawed. The action parts are mounted on Steinway's tubular metallic frame. The Steinway hammers are cut from virgin wool felt, containing no admixture of other materials. In 1963, the Queens Steinway factory introduced the Permafree action for its grand pianos, using Teflon parts in place of cloth bushings. The Teflon was intended to withstand wear and humidity changes better than cloth. The Teflon bushings resulted in certain unforeseen problems mainly during changes in weather; they were discontinued in 1982. The Hamburg Steinway factory never implemented the Teflon bushings in its pianos. The pianos have steel strings in the midsection and treble, with bass strings made of copper-wound steel. The strings are uniformly spaced with one end coiled around the tuning pins, which in turn are inserted in a laminated wooden block called the pinblock or wrestplank. The tuning pins keep the strings tight and are held in place by friction. Steinway also employs front and rear duplex scales, in which the main vibrating section of the string is augmented by a much smaller vibration in the two ends of the string which are fastened in place. Steinway was a friend of the German physicist Hermann von Helmholtz, and this friendship led to the development and Steinway patent in 1872 of front and back aliquots, allowing the traditionally dead sections of strings to vibrate in sympathy with the main string. The result is a fuller, more complex sound. The pinblock, also known as wrestplank, in Steinway pianos is made of six layers of hard-textured wood that are glued together, set at a 45° angle to the run of the grain. It is designed to keep the piano in tune longer. In contrast to other piano makers, who presented their pianos to pianists, William Steinway engaged the Russian pianist Anton Rubinstein to play Steinway pianos during Rubinstein's first and only American concert tour from 1872 to 1873, with 215 concerts in 239 days. It was a success for both Rubinstein and Steinway. Thus, the Steinway Artist program was born. Later the Polish pianist Ignacy Jan Paderewski toured America playing 107 concerts on Steinway pianos in 117 days. As of May 2017[update], around 1,800 pianists worldwide are official Steinway Artists, which means that they have chosen to perform on Steinway pianos exclusively, and each owns a Steinway. None are paid to do so. Steinway Artists come from different genres: classical, jazz, pop, and rock. A few examples of Steinway Artists are Daniel Barenboim, Harry Connick, Jr., Billy Joel, Evgeny Kissin, Diana Krall, and Lang Lang, and a few examples of Immortal Steinway Artists are Irving Berlin, Benjamin Britten, George Gershwin, Vladimir Horowitz, Cole Porter, and Sergei Rachmaninoff. Steinway expects Steinway Artists to perform on Steinway pianos where they are available and in appropriate condition. Artur Schnabel complained once that "Steinway refused to let me use their pianos [i.e., Steinway pianos owned by Steinway] unless I would give up playing the Bechstein piano – which I had used for so many years – in Europe. They insisted that I play on Steinway exclusively, everywhere in the world, otherwise they would not give me their pianos in the United States. That is the reason why from 1923 until 1930 I did not return to America. ... [in] 1933, Steinway changed their attitude and agreed to let me use their pianos in the United States, even if I continued elsewhere to play the Bechstein piano ... Thus, from 1933 on, I went every year to America." In 1972, Steinway responded to Garrick Ohlsson's statement that Bösendorfer was "the Rolls-Royce of pianos" by trucking away the Steinway-owned grand piano that Ohlsson was about to give a recital on at Alice Tully Hall in New York City. Ohlsson ended up performing on a Bösendorfer piano borrowed at the eleventh hour, and Steinway would not let him borrow Steinway-owned pianos for some time. Ohlsson has since made peace with Steinway. Angela Hewitt was removed from the Steinway Artist roster around 2002 after she purchased and performed on a Fazioli piano. After the Canadian pianist Louis Lortie was removed from the Steinway Artist roster in 2003, he complained in a newspaper article that Steinway is trying to establish a monopoly on the concert world by becoming "the Microsoft of pianos." A Steinway spokesman said, in response to Lortie's decision to perform a concert on a Fazioli piano, that Steinway does not want anyone on the Steinway Artist roster who does not want to play the Steinway exclusively. According to musicologist Stuart de Ocampo, "That Steinway aggressively sought out and paid (in various forms) for artist endorsements must be stressed in order to combat an idealistic notion that the greatest flocked to Steinway simply because it was the best." More generally, Stuart de Ocampo endorses the view of Donald W. Fostle, who wrote in a company history of Steinway that "the genius of Steinways ... ultimately lay in their ability to persuade millions of persons across decades and continents that in this realm of supreme subjectivity, individual variation, incertitude, and ever-changing conditions, there was an absolute best. The assertion, repeated often enough, took on the coloration of fact", but Stuart de Ocampo concludes that "Innovations in piano construction carved out a unique sound for the Steinway pianos in the mid-nineteenth century. Medals at fairs and international exhibitions were the basis of Steinway & Sons' early reputation." Paying for pianists' endorsements back then was not specific to Steinway. As there were financial incentives for testimonials, several famous pianists had no qualms about endorsing more than one piano brand. Franz Liszt endorsed Steinway, Bösendorfer, Chickering, Erard, Ibach, Mason & Risch, and Steck at the same time. Today, no pianist is paid by Steinway, and when Steinway Artists loan pianos from Steinway for a concert or recording session the artists do have to pay Steinway for preparing, tuning, and delivering of the piano. According to management academic David Liebeskind, the Steinway Artist program "... is one of the only pure product endorsements programs, as no artist is paid to play on or endorse a Steinway piano." The Steinway Artist program has been copied by other piano companies, but Steinway's program is unique in that a pianist must promise to play pianos of the Steinway brand only to become a Steinway Artist. The Steinway Artist designation restricts a pianist's use of pianos by other makers and implies an obligation to perform on Steinway pianos. The All-Steinway School designation is given by Steinway to educational institutions of music in which not less than 90 percent of the pianos are designed by Steinway. Steinway does not offer the pianos free of charge but requires that the institutions buy them. Performance venues, teaching studios, and practice rooms for piano students must be equipped with Steinway pianos. Teaching studios and practice rooms for other students may be equipped with Boston or Essex pianos; some All-Steinway Schools have chosen to have Steinway pianos in these rooms also. It is required that the pianos are kept in performance-quality condition and All-Steinway Schools must have piano technicians that participate in Steinway's technical training programs. If the pianos are not maintained in performance-quality condition, Steinway can withdraw the All-Steinway School designation. The Oberlin Conservatory of Music in Ohio holds the longest partnership with Steinway. They have used Steinway pianos exclusively since 1877, 24 years after Steinway was founded. In 2007, they obtained their 200th Steinway piano, a model D-274 manufactured at Steinway's factory in Hamburg, Germany. Other examples of All-Steinway Schools are the Yale School of Music at Yale University in Connecticut, the Curtis Institute of Music in Pennsylvania, Royal Holloway, University of London, the University of Melbourne Faculty of VCA and MCM in Australia, and the Central Conservatory of Music in Beijing. In 2007, the Crane School of Music in Potsdam, New York, was added to the All-Steinway School roster, receiving 141 pianos in one $3.8 million order. In 2009, the University of Cincinnati – College-Conservatory of Music in Ohio became designated an All-Steinway School, based on a $4.1 million order of 165 new pianos, one of the largest orders Steinway has ever processed. As of November 2017[update], there are more than 190 All-Steinway Schools around the world. Several international piano competitions use Steinway pianos. Steinway has been selected exclusively by such competitions as the Van Cliburn International Piano Competition in Fort Worth, Texas, the Gina Bachauer International Piano Competition in Salt Lake City, Utah, the International Johann Sebastian Bach Competition in Leipzig, Germany, the Queen Elisabeth Competition in Brussels, Belgium, the Ferruccio Busoni International Piano Competition in Bolzano, Italy, and the Long-Thibaud-Crespin Competition in Paris. "Sudden Mania to become Pianists created upon hearing Steinway's Pianos at the Paris Exposition." This lithograph by Amédée de Noé a.k.a. Cham conveys the popularity of the Steinway piano, the musicality of which had just been demonstrated by pianist Désiré Magnus at the 1867 Exposition Universelle in Paris. (Harper's Weekly, August 10, 1867, reporting on the world exposition). In 1839, Heinrich Engelhard Steinweg exhibited three pianos at the state trade exhibition in Braunschweig, Germany, and was awarded a gold medal. In 1855, Steinway attended the Metropolitan Mechanics Institute fair in Washington, D.C. and won 1st prize. In 1855, Steinway exhibited at the American Institute Fair in the New York Crystal Palace in what is now Bryant Park in New York City. Steinway won a gold medal. A reporter wrote the following about Steinway: "Their square pianos are characterized by great power of tone, a depth and richness in the bass, a full mellowness in the middle register and brilliant purity in the treble, making a scale perfectly equal and singularly melodious throughout its entire range. In touch, they are all that could be desired." From 1855 to 1862, Steinway pianos received 35 medals in the United States alone, since which time Steinway entered their pianos at international exhibitions only. In 1862, for the International Exhibition in London, Steinway shipped two square pianos and two grand pianos to England (two to Liverpool and two to London) and won 1st prize. In 1867, Steinway won three awards at the International Exposition in Paris: the Grand Gold Medal of Honor, the Grand Annual Testimonial Medal, and an honorary membership of the Société Nationale des Beaux-Arts. These awards won in Europe increased the demand for Steinway pianos, thus the reason the family looked into opening a store in London. The International Exposition of 1867 established Steinway as the leading choice for pianos in Europe. In 1876, at the Centennial Exposition in the United States, Steinway received the two highest awards and a certificate of the judges showing a rating of 95.5 of a possible 96. In 1885, Steinway received the gold medal at the International Inventions Exhibition in London and the grand gold medal of the Royal Society of Arts in London. In 2007, the National Medal of Arts was awarded to Henry Z. Steinway and presented by US President George W. Bush in an East Room ceremony at the White House. Henry Z. Steinway received the award for "... his devotion to preserving and promoting quality craftsmanship and performance, as an arts patron and advocate for music and music education; and for continuing the fine tradition of the Steinway piano..."
In 2014, Steinway received the Red Dot product design award for the Arabesque limited edition grand piano. The jury wrote: "The design of the Arabesque impresses through elegance and individuality. It thus excellently complements the high-class product line of this renowned manufacturing house." Patent No. 26,532 (December 20, 1859): The bass strings are "overstrung" above the treble strings to provide more length and better tonal quality. The invention won 1st prize medal at the 1862 International Exhibition in London. Today, the invention is a standard feature of grand piano construction. Patent No. 126,848 (May 14, 1872): Steinway invented the duplex scale on the principle of enabling the freely oscillating parts of the string, directly in front of and behind the segment of the string actually struck, also to resound. The outcome is a large range and fullness of overtones – one of the characteristics of the Steinway sound. Patent No. 127,383 (May 28, 1872): In a Steinway piano, the cast iron plate rests on wooden dowels without actually touching the soundboard. It is lightly curved, creating a large hollow between the plate and the soundboard. This cavity acts as a reinforcement of the resonant properties. Patent No. 156,388 (October 27, 1874): Steinway invented the middle piano pedal, called the sostenuto pedal. The sostenuto pedal gives the pianist an ability to create what is called an organ pedal point by keeping a specific note's damper, or notes' dampers, in their open position(s), allowing those strings to continue to sound while other notes can be played without continuing to resonate. Patent No. 170,645 (November 30, 1875): Steinway's Regulation Action Pilot, also known as Capstan Screw, lifts the parts that drive the hammer toward the string. The Steinway device was adjustable, an advance that simplifies the chore of modifying a piano's action to a pianist's liking. Patent No. 233,710 (October 26, 1880): The bridge transmits the vibration of the strings to the soundboard. In a Steinway piano, the bridge consists of vertically glued laminations; a principle that ensures that vibrations are easily developed and forwarded. Patent No. 314,742 (March 31, 1885): The rim of Hamburg-made Steinway pianos consists of layers of hard rock maple and mahogany and the rim of Queens-made Steinway pianos consists of layers of hard rock maple only. The layers are pressed together into one piece in one operation. Patent No. 2,051,633 (August 18, 1936): The soundboard resembles a membrane. The special molding, gradually tapering from the center to the edge, provides great flexibility and freer vibration across the board. Patent No. 3,091,149 (May 28, 1963): The pinblock, also known as wrestplank, is designed to keep the piano in tune longer. Steinway uses six glued layers of hard-textured wood, set at a 45° angle to the run of the grain. Ignacy Jan Paderewski performing on a Steinway grand piano waltz in C sharp minor, Op. 64, No. 2, composed by Frédéric Chopin. (Studio recording from 1917). 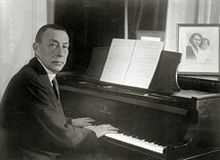 Sergei Rachmaninoff performing on a Steinway grand piano waltz in E flat major, Op. 18, composed by Frédéric Chopin. (Studio recording from 1921). The White House's Steinway art case grand piano from 1938. Lin-Manuel Miranda (rapping) and Alex Lacamoire (piano) performing "The Hamilton Mixtape", composed by Lin-Manuel Miranda, at the White House Evening of Poetry, Music and the Spoken Word. (Concert recording from 2009). Harry Connick, Jr. and his band performing "When the Saints Go Marching In". Harry Connick, Jr. plays on a Steinway grand piano. (Concert recording from 2010). ^ Fostle, Donald W. (1995). The Steinway Saga: An American Dynasty. New York: Scribner. p. 25. ISBN 978-0-684-19318-2. ^ a b c Panchyk, Richard (2008). German New York City. Arcadia Publishing. p. 50. ISBN 978-0-7385-5680-2. ^ Stevens, Mark A. (2000). Merriam-Webster's Collegiate Encyclopedia. Merriam-Webster. p. 1540. ISBN 978-0-87779-017-4. ^ a b Fine, Larry (2014). Acoustic & Digital Piano Buyer – Fall 2014. Brookside Press LLC. pp. 194–195. ISBN 978-1-929145-39-3. ^ a b c "Steinway Musical Instruments 2012 Annual Report on Form 10-K". U.S. Securities and Exchange Commission. March 14, 2013. p. 5. Retrieved February 18, 2015. ^ Fine, Larry (2015). Acoustic & Digital Piano Buyer – Spring 2015. Brookside Press LLC. p. 193. ISBN 978-1-929145-40-9. ^ a b c Fine, Larry (2015). Acoustic & Digital Piano Buyer – Spring 2015. Brookside Press LLC. p. 192. ISBN 978-1-929145-40-9. ^ Fasola, Wilma; Bock, Henning; Pfenninger, Tessa (February 17, 2016). "Steinway & Sons – Grand Success". The Brander. Retrieved September 14, 2017. ^ Barron, James (2006). Piano: The Making of a Steinway Concert Grand. New York: Holt. p. 235. ISBN 978-0-8050-7878-7. ^ Good, Edwin M. (2002). Giraffes, black dragons, and other pianos: a technological history from Cristofori to the modern concert grand. Stanford University Press. p. 303. ISBN 978-0-8047-4549-9. ^ Giordano, Sr., Nicholas J. (2010). Physics of the Piano. Oxford, United Kingdom: Oxford University Press. p. 139. ISBN 978-0-19-954602-2. ^ a b c Lenehan, Michael (2003) . "The Quality of the Instrument (K 2571 – The Making of a Steinway Grand)". The Atlantic Monthly. Retrieved February 9, 2015. ^ a b Steinway & Sons Documentary – A World of Excellence. Shanghai Hantang Culture Development Co., Ltd. July 3, 2013. Event occurs at 6:16. Retrieved March 14, 2015 – via official YouTube channel of Steinway & Sons. ^ "Restoration". Courtney Pianos Ltd. Retrieved February 6, 2017. ^ "Bluthner Pianos at The Piano Shop Bath". The Piano Shop Bath. May 10, 2013. Retrieved February 6, 2017. ^ "About Us". Henderson Pianos Sydney Australia. Retrieved February 6, 2017. ^ a b c d e f Liebeskind, David (2003). "The Keys To Success". Stern Business. New York: Stern School of Business, New York University. Fall/Winter 2003 – "The Producers": 10–15. Retrieved February 9, 2015. ^ Giordano, Sr., Nicholas J. (2010). Physics of the Piano. Oxford, United Kingdom: Oxford University Press. p. 137. ISBN 978-0-19-954602-2. ^ a b Palmieri, Robert, ed. (2003). The Piano: An Encyclopedia (2nd ed.). Routledge, Taylor & Francis Group. p. 366. ISBN 0-415-93796-5. ^ Elliott, Alan C. (1998). A daily dose of the American dream: Stories of success, triumph and inspiration. United States: Rutledge Hill Press. ISBN 978-1-55853-592-3. ^ Ehrlich, Cyril (1990). The Piano: A History. Oxford, United Kingdom: Oxford University Press. p. 47. ISBN 978-0-19-816171-4. ^ Derdak, Thomas; Grant, Tina (1997). International Directory of Company Histories. 19. St. James Press. p. 426. ISBN 978-1-55862-353-8. ^ a b Kehl, Roy F.; Kirkland, David R. (2011). The Official Guide to Steinway Pianos. United States: Amadeus Press. pp. 133–138. ISBN 978-1-57467-198-8. ^ a b Cummings, Thomas; Worley, Christopher (2014). Organization Development and Change. Cengage Learning. p. 102. ISBN 978-1-305-14303-6. ^ Midgette, Anne (September 5, 2015). "Pianos: Beyond the Steinway monoculture". The Washington Post. Retrieved October 26, 2015. ^ Hough, Stephen (October 23, 2011). "A tone too subtle for modern ears: Stephen Hough mourns the fall of Bechstein, piano-makers to emperors of a bygone era". The Independent. Retrieved October 26, 2015. ^ a b c d e Singer, Aaron (1986). Labor management relations at Steinway & Sons, 1853–1896. Garland. p. 14. ISBN 978-0-8240-8371-7. ^ a b Spillane, Daniel (1892). "Musical Instruments – The Piano-Forte". The Popular Science Monthly. Bonnier Corporation. 40 (31): 488. ISSN 0161-7370. ^ Kehl, Roy F.; Kirkland, David R. (2011). The Official Guide to Steinway Pianos. United States: Amadeus Press. p. 105. ISBN 978-1-57467-198-8. ^ a b c d e Ratcliffe, Ronald V. (2002). Steinway. San Francisco: Chronicle Books. p. 45. ISBN 978-0-8118-3389-9. ^ a b Daniell, Charles A. (1895). Musical instruments at the World's Columbian Exposition. Chicago: Presto Co. p. 293. ^ a b c d e Kennedy, Robert C. (August 10, 1867). "Cartoon of the Day – Sudden Mania to Become Pianists ..." Harper's Weekly. Retrieved February 9, 2015. ^ Milner, Glen (producer and director); Bright, Richard (executive producer); Wanamaker, Zoe (narrator) (June 27, 2016). "Steinway". Handmade: By Royal Appointment. Episode 4. BBC. BBC Four. ^ "Steinway & Sons". The Royal Warrant Holders Association. Retrieved February 18, 2015. ^ a b c Fine, Larry (2014). Acoustic & Digital Piano Buyer – Fall 2014. Brookside Press LLC. p. 162. ISBN 978-1-929145-39-3. ^ a b c Fine, Larry (2014). Acoustic & Digital Piano Buyer – Fall 2014. Brookside Press LLC. p. 166. ISBN 978-1-929145-39-3. ^ Ratcliffe, Ronald V. (2002). Steinway. San Francisco: Chronicle Books. p. 17. ISBN 978-0-8118-3389-9. ^ Lieberman, Richard K. (1995). Steinway & Sons. New Haven, Connecticut: Yale University Press. pp. 14–15. ISBN 978-0-300-06364-6. ^ a b c d Ratcliffe, Ronald V. (2002). Steinway. San Francisco: Chronicle Books. pp. 23 and 26–27. ISBN 978-0-8118-3389-9. ^ Goldenberg, Susan (1996). Steinway: From glory to controversy; the family, the business, the piano. Oakville, Ontario: Mosaic Press. p. 20. ISBN 978-0-88962-607-2. ^ "Sounds like a rich history: Behind Steinway & Son[s]". Barnebys. May 19, 2015. Retrieved February 13, 2016. ^ "Steinway Ausstellung von Dirk Stroschein – "William Steinway in New York" im Städtischen Museum Seesen" [Steinway exhibition by Dirk Stroschein – "William Steinway in New York" in Städtischen Museum Seesen] (in German). Klavierschule Osterode. Retrieved February 13, 2016. ^ Spillane, Daniel (1892). "Musical Instruments – The Piano-Forte". The Popular Science Monthly. Bonnier Corporation. 40 (31): 489. ISSN 0161-7370. ^ Lieberman, Richard K. (1995). Steinway & Sons. New Haven, Connecticut: Yale University Press. p. 17. ISBN 978-0-300-06364-6. ^ Ratcliffe, Ronald V. (2002). Steinway. San Francisco: Chronicle Books. pp. 39–40. ISBN 978-0-8118-3389-9. ^ Ratcliffe, Ronald V. (2002). Steinway. San Francisco: Chronicle Books. pp. 26–27. ISBN 978-0-8118-3389-9. ^ a b de Ocampo, Stuart (1997). "Review: The Steinway Saga: An American Dynasty by Donald W. Fostle; Steinway & Sons by Richard K. Lieberman". American Music. 15 (3): 409. ^ Barron, James (2006). Piano: The Making of a Steinway Concert Grand. New York: Holt. pp. 102–109. ISBN 978-0-8050-7878-7. ^ Wolff, Isabel (February 15, 1997). "Lifting the lid on the Steinways". The Daily Telegraph. Retrieved October 26, 2015. ^ Fostle, Donald W. (January 21, 1996). "The Steinway Story". The New York Times. Retrieved October 26, 2015. ^ a b c Ratcliffe, Ronald V. (2002). Steinway. San Francisco: Chronicle Books. p. 46. ISBN 978-0-8118-3389-9. ^ Lieberman, Richard K. (1995). Steinway & Sons. New Haven, Connecticut: Yale University Press. p. 45. ISBN 978-0-300-06364-6. ^ Ratcliffe, Ronald V. (2002). Steinway. San Francisco: Chronicle Books. p. 74. ISBN 978-0-8118-3389-9. ^ a b c d e Barron, James (August 27, 2003). "Steinways With German Accents; Pianos Made in Queens Have Cousins in Hamburg". The New York Times. Retrieved February 15, 2015. ^ a b Beckert, Sven (2003). The Monied Metropolis: New York City and the Consolidation of the American Bourgeoisie, 1850–1896. Cambridge University Press. pp. 274–275. ISBN 978-0-521-52410-0. ^ a b Lieberman, Richard K. (1995). Steinway & Sons. New Haven, Connecticut: Yale University Press. p. 6. ISBN 978-0-300-06364-6. ^ a b Saffle, Michael; Deaville, James, eds. (1997). New Light on Liszt and His Music: Essays in Honor of Alan Walker's 65th Birthday. Franz Liszt Studies Series. 6. Pendragon Press. p. 316. ISBN 978-0945193739. ^ a b Wainwright, David (1975). The Piano Makers. Humanities Pr. p. 119. ISBN 978-0-09-122950-4. ^ Loesser, Arthur (1954). Men, Women and Pianos: A social History. University of California. p. 553. ISBN 978-0-486-26543-8. ^ Goldenberg, Susan (1996). Steinway: From glory to controversy; the family, the business, the piano. Oakville, Ontario: Mosaic Press. p. 58. ISBN 978-0-88962-607-2. 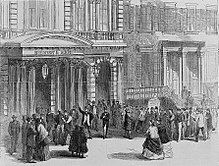 ^ "Buying tickets for the Dickens readings at Steinway Hall". Library of Congress. Retrieved January 8, 2016. ^ Ratcliffe, Ronald V. (2002). Steinway. San Francisco: Chronicle Books. p. 29. ISBN 978-0-8118-3389-9. ^ a b Ratcliffe, Ronald V. (2002). Steinway. San Francisco: Chronicle Books. p. 109. ISBN 978-0-8118-3389-9. ^ Lieberman, Richard K. (1995). Steinway & Sons. New Haven, Connecticut: Yale University Press. p. 48. ISBN 978-0-300-06364-6. ^ Lieberman, Richard K. (1995). Steinway & Sons. New Haven, Connecticut: Yale University Press. p. 51. ISBN 978-0-300-06364-6. ^ a b Winn, Christopher (2013). I Never Knew That About New York. Ebury Press. p. 160. ISBN 978-0-09-194524-4. ^ "Steinway Hall's Final Movement Begins Following $131 M. Sale". Commercial Observer, The New York Observer. Retrieved February 1, 2015. ^ Dangremond, Sam (April 12, 2016). "Take a Tour of the New Steinway Hall". Town & Country. Retrieved April 19, 2016. ^ Ratcliffe, Ronald V. (2002). Steinway. San Francisco: Chronicle Books. p. 56. ISBN 978-0-8118-3389-9. ^ a b c "Treasures of the White House: Steinway Grand Piano". The White House Historical Association. Retrieved August 5, 2015. ^ Ratcliffe, Ronald V. (2002). Steinway. San Francisco: Chronicle Books. p. 149. ISBN 978-0-8118-3389-9. ^ Prettejohn, Elizabeth (March 1, 2002). "Lawrence Alma-Tadema and the modern city of ancient Rome". The Art Bulletin. ^ a b c Ratcliffe, Ronald V. (2002). Steinway. San Francisco: Chronicle Books. p. 158. ISBN 978-0-8118-3389-9. ^ Carr, Elizabeth (2006). Shura Cherkassky: The Piano's Last Czar. Scarecrow Press, Inc. p. 21. ISBN 978-0-8108-5410-9. ^ Ratcliffe, Ronald V. (2002). Steinway. San Francisco: Chronicle Books. p. 167. ISBN 978-0-8118-3389-9. ^ a b Gambaccini, Paul (September 29, 2011). "Playing the White House: Entertaining with the US president". BBC News Magazine. Retrieved February 14, 2015. ^ Barron, James (April 2, 2004). "A Piano Is Born, Needing Practice; Full Grandness of K0862 May Take Several Concerts to Achieve". The New York Times. Retrieved February 14, 2015. ^ Ratcliffe, Ronald V. (2002). Steinway. San Francisco: Chronicle Books. p. 76. ISBN 978-0-8118-3389-9. ^ Barron, James (July 15, 2007). "Let's Play Two: Singular Piano". The New York Times. Retrieved February 14, 2015. ^ Ratcliffe, Ronald V. (2002). Steinway. San Francisco: Chronicle Books. pp. 49–55. ISBN 978-0-8118-3389-9. ^ Hundley, Tom (April 30, 2008). "Aftermath favored Steinway". Chicago Tribune. Retrieved February 14, 2015. ^ MacMahon, Lloyd Francis (October 1, 1973). "Grotrian v. Steinway & Sons". United States District Court for the Southern District of New York. Archived from the original on February 5, 2015. Retrieved February 14, 2015. ^ Rothman, Jennifer E. (October 2005). "Initial Interest Confusion: Standing at the Crossroads of Trademark Law" (PDF). Cardozo Law Review. Yeshiva University. 27 (1): 114–116. Retrieved February 14, 2015. ^ Yu, Peter K. (2007). Intellectual Property and Information Wealth: Trademark and Unfair Competition. Intellectual Property and Information Wealth: Issues and Practices in the Digital Age. 3. Praeger Publishers, Greenwood Publishing Group. pp. 87–88. ISBN 0-275-98885-6. ^ Ratcliffe, Ronald V. (2002). Steinway. San Francisco: Chronicle Books. p. 61. ISBN 978-0-8118-3389-9. ^ a b Giordano, Sr., Nicholas J. (2010). Physics of the Piano. Oxford, United Kingdom: Oxford University Press. p. 148. ISBN 978-0-19-954602-2. ^ "CBS Steinway Sale". The New York Times. September 14, 1985. Retrieved February 14, 2015. ^ Lieberman, Richard K. (1995). Steinway & Sons. New Haven, Connecticut: Yale University Press. p. 308. ISBN 978-0-300-06364-6. ^ Ratcliffe, Ronald V. (2002). Steinway. San Francisco: Chronicle Books. p. 188. ISBN 978-0-8118-3389-9. ^ Ratcliffe, Ronald V. (2002). Steinway. San Francisco: Chronicle Books. pp. 188–189. ISBN 978-0-8118-3389-9. ^ a b Ratcliffe, Ronald V. (2002). Steinway. San Francisco: Chronicle Books. p. 189. ISBN 978-0-8118-3389-9. ^ Broyles, Michael (2011). Beethoven in America. United States: Indiana University Press. p. 335. ISBN 978-0-253-35704-5. ^ Fine, Larry (2014). Acoustic & Digital Piano Buyer – Fall 2014. Brookside Press LLC. p. 194. ISBN 978-1-929145-39-3. ^ Kopf, Silas (2008). A marquetry odyssey: Historical objects and personal work. Hudson Hills. p. 169. ISBN 978-1-55595-287-7. ^ Carr, Elizabeth (2006). Shura Cherkassky: The Piano's Last Czar. Scarecrow Press, Inc. p. 204. ISBN 978-0-8108-5410-9. ^ "DeVoe Moore adds world-famous Steinway to his museum". Tallahassee Democrat. December 4, 2014. Retrieved February 6, 2015. ^ "Steinway gründete die erste Akademie für Konzert[t]echniker" [Steinway founded the first academy for concert technicians]. Musikhandel (in German). Deutscher Musikverleger-Verband. 45: 180. 1994. ^ Mont, Joe (October 18, 2011). "10 Things Still Made in America". MainStreet. TheStreet, Inc. Retrieved February 6, 2015. ^ a b c d Kehl, Roy F.; Kirkland, David R. (2011). The Official Guide to Steinway Pianos. United States: Amadeus Press. p. 127. ISBN 978-1-57467-198-8. ^ "George Michael buys Lennon's piano". BBC News. October 18, 2000. Retrieved February 15, 2015. ^ "Carnegie Hall Congratulates Steinway & Sons on 160 Years of Greatness". Carnegie Hall. March 15, 2013. Retrieved February 5, 2015. ^ "Stars To Celebrate Steinway Anniversary". Billboard. June 3, 2003. Retrieved January 11, 2016. ^ a b c Ivry, Benjamin (July 31, 2006). "A Truly Grand Monopoly: How Steinway Calls the Tune". New York Observer. Retrieved January 11, 2016. ^ Iken, Matthias (April 19, 2005). "125 Jahre Steinway – Festakt für eine Ikone" [125 years Steinway – Celebration for an icon] (in German). Die Welt. Retrieved January 12, 2016. ^ Peters, Helmut (April 16, 2005). "So weit die Flügel tragen – 125 Jahre Steinway" (in German). Die Welt. Retrieved January 12, 2016. ^ a b "Pressemeldung: Designer Albrecht Graf Goertz verstorben" [Press release: Designer Albrecht Count Goertz dead] (in German). BMW Group. November 3, 2006. Retrieved January 12, 2016. ^ Cole, Diane (June 6, 2003). "Fanfare for the Uncommon Piano". The New York Times. Retrieved February 14, 2015. ^ Barron, James (September 18, 2008). "Henry Z. Steinway, Piano Maker, Dies at 93". The New York Times. Retrieved February 14, 2015. ^ a b Neudorf, Paula; Soon, Weilun. "Recession's Impact". The Last American Grand. Retrieved February 14, 2015. ^ "Steinway Musical Instruments 2010 Annual Report on Form 10-K" (PDF). Steinway Musical Instruments, Inc. March 14, 2011. p. 3. Archived from the original (PDF) on October 4, 2013. Retrieved February 18, 2015. ^ "Steinway Musical Instruments 2011 Annual Report on Form 10-K" (PDF). Steinway Musical Instruments, Inc. March 14, 2012. p. 3. Archived from the original (PDF) on October 4, 2013. Retrieved February 18, 2015. ^ Roumeliotis, Greg (July 1, 2013). "Kohlberg to buy grand piano maker Steinway for $438 million". Reuters. Retrieved January 4, 2016. ^ Ring, Niamh; Murphy, Lauren S.; Klein, Jodi Xu (August 14, 2013). "Steinway Agrees to Be Bought by Paulson for $512 Million". Bloomberg L.P. Retrieved February 19, 2015. ^ Greene, Kerima (October 8, 2013). "For John Paulson, Steinway deal means more than profits". CNBC LLC. Retrieved August 5, 2015. ^ a b Stinson, Liz (April 1, 2015). "Steinway's New Piano Can Play a Perfect Concerto by Itself". Wired. Retrieved April 7, 2016. ^ Kessler, Ken (April 22, 2015). "Steinway's self-playing piano". The Daily Telegraph. Retrieved April 7, 2016. ^ "About Us". Live Performance, Inc. Retrieved April 7, 2016. ^ "Live-Performance Model LX High Resolution Retrofit Piano Player System". Grand Piano Haus. August 2, 2014. Retrieved April 7, 2016. ^ Fine, Larry (2016). Acoustic & Digital Piano Buyer – Spring 2016. Brookside Press LLC. p. 154. ISBN 978-1-929145-41-6. ^ "Steinway & Sons unveils its 600,000th piano". Luxuo. June 15, 2015. Retrieved December 31, 2015. ^ Jones, Graham (June 30, 2015). "Steinway & Sons "The Fibonacci"". Ape to Gentleman. Retrieved December 31, 2015. ^ a b Fine, Larry (2015). Acoustic & Digital Piano Buyer – Fall 2015. Brookside Press LLC. pp. 247 and 249. ISBN 978-1-929145-42-3. ^ a b Fine, Larry (2015). Acoustic & Digital Piano Buyer – Fall 2015. Brookside Press LLC. pp. 247–248. ISBN 978-1-929145-42-3. ^ "Louis Comfort Tiffany and Laurelton Hall: An Artist's Country Estate". The Metropolitan Museum of Art. Retrieved February 6, 2015. ^ Frelinghuysen, Alice Cooney; Monica, Monica. "Louis Comfort Tiffany and Laurelton Hall". Antiques and Fine Art. Retrieved February 15, 2015. ^ Ratcliffe, Ronald V. (2002). Steinway. San Francisco: Chronicle Books. pp. 156 and 158. ISBN 978-0-8118-3389-9. ^ a b "Designed by Sir Lawrence Alma-Tadema – Model D Pianoforte and Stools". Clark Art Institute. Retrieved February 6, 2015. ^ "A Reading from Homer – British Painting in the Philadelphia Museum of Art". Philadelphia Museum of Art. Retrieved August 5, 2015. ^ "Steinways". The Guardian. June 6, 2003. Retrieved February 18, 2015. ^ a b Joshi, Mohit (May 11, 2008). "Steinway & Sons unveils most expensive piano". Topnews. Manas Informatics Pvt. Ltd. Retrieved February 15, 2015. ^ a b "November: 'Art' piano is Expo musical key". Shme – Today's Shanghai. Retrieved February 15, 2015. ^ a b "The Steinway Crown Jewels. A Sought After Musical Gem". Eat Love Savor. Tunner Media. January 20, 2015. Retrieved February 6, 2015. ^ Barron, James (2006). Piano: The Making of a Steinway Concert Grand. New York: Holt. p. 238. ISBN 978-0-8050-7878-7. ^ "Steinway Musical Instruments 2012 Annual Report on Form 10-K". U.S. Securities and Exchange Commission. March 14, 2013. p. 3. Retrieved February 18, 2015. ^ a b "Steinway Musical Instruments 2012 Annual Report on Form 10-K". U.S. Securities and Exchange Commission. March 14, 2013. p. 6. Retrieved February 18, 2015. ^ a b Mohr, Franz; Schaeffer, Edith (1996). My Life with the Great Pianists (2nd ed.). Baker Books. p. 50. ISBN 978-0-8010-5710-6. ^ Quillman, Catherine (April 14, 2002). "Science teacher wins U.S. grant for school Father of the year named Up and Coming". The Philadelphia Inquirer. Retrieved January 18, 2016. ^ "Emanuel Ax". The Juilliard School. Retrieved February 7, 2015. ^ Fine, Larry (2017). Acoustic & Digital Piano Buyer – Spring 2017. Brookside Press LLC. pp. 37 and 40. ISBN 978-192914544-7. ^ Fine, Larry (2011). Acoustic & Digital Piano Buyer – Spring 2011. Brookside Press LLC. pp. 81–87. ISBN 978-1-929145-31-7. ^ Fine, Larry (2011). Acoustic & Digital Piano Buyer – Spring 2011. Brookside Press LLC. p. 44. ISBN 978-1-929145-31-7. ^ Ratcliffe, Ronald V. (2002). Steinway. San Francisco: Chronicle Books. p. 62. ISBN 978-0-8118-3389-9. ^ Stewart, Jude (2003). "Just about perfect: The dichotomy of Steinway piano design". STEP Inside Design. 19 (November/December): 68. ^ Grant, Tina, ed. (1998). International Directory of Company Histories. 19. St James Press. p. 427. ISBN 978-1-55862-353-8. ^ Freudenheim, Ellen (2006). Queens. St. Martin's Griffin. p. 34. ISBN 978-0-312-35818-1. ^ Barron, James (2006). Piano: The Making of a Steinway Concert Grand. New York: Holt. p. 14. ISBN 978-0-8050-7878-7. ^ a b Ratcliffe, Ronald V. (2002). Steinway. San Francisco: Chronicle Books. p. 86. ISBN 978-0-8118-3389-9. ^ Goldenberg, Susan (1996). Steinway: From glory to controversy; the family, the business, the piano. Oakville, Ontario: Mosaic Press. p. 26. ISBN 978-0-88962-607-2. ^ Barron, James (2006). Piano: The Making of a Steinway Concert Grand. New York: Holt. p. 119. ISBN 978-0-8050-7878-7. ^ Goldenberg, Susan (1996). Steinway: From glory to controversy; the family, the business, the piano. Oakville, Ontario: Mosaic Press. p. 202. ISBN 978-0-88962-607-2. ^ Barron, James (2006). Piano: The Making of a Steinway Concert Grand. New York: Holt. pp. 73–74. ISBN 978-0-8050-7878-7. ^ Fine, Larry (1987). The Piano Book. Brookside Press LLC. p. 151. ISBN 0-9617512-1-5. ^ a b Mohr, Franz; Schaeffer, Edith (1996). My Life with the Great Pianists (2nd ed.). Baker Books. p. 103. ISBN 978-0-8010-5710-6. ^ a b c Mohr, Franz; Schaeffer, Edith (1996). My Life with the Great Pianists (2nd ed.). Baker Books. p. 104. ISBN 978-0-8010-5710-6. ^ Fine, Larry (2015). Acoustic & Digital Piano Buyer – Fall 2015. Brookside Press LLC. p. 193. ISBN 978-1-929145-42-3. ^ Barron, James (2006). Piano: The Making of a Steinway Concert Grand. New York: Holt. p. 164. ISBN 978-0-8050-7878-7. ^ Chapin, Miles (1997). 88 keys: The making of a Steinway piano. New York: Potter. pp. 71–72. ISBN 978-0-517-70356-4. ^ Barron, James (2006). Piano: The Making of a Steinway Concert Grand. New York: Holt. pp. 160–161. ISBN 978-0-8050-7878-7. ^ Good, Edwin M. (2002). Giraffes, black dragons, and other pianos: a technological history from Cristofori to the modern concert grand. Stanford University Press. p. 197. ISBN 978-0-8047-4549-9. ^ Palmieri, Robert, ed. (2003). The Piano: An Encyclopedia (2nd ed.). Routledge, Taylor & Francis Group. p. 22. ISBN 0-415-93796-5. ^ a b Hui, Alexandra (2013). The Psychophysical Ear: Musical Experiments, Experimental Sounds, 1840–1910. MIT Press. pp. 73–75. ISBN 978-0-262-01838-8. ^ Lieberman, Richard K. (1995). Steinway & Sons. New Haven, Connecticut: Yale University Press. p. 61. ISBN 978-0-300-06364-6. ^ a b Campbell, Murray; Greated, Clive; Myers, Arnold (2004). Musical Instruments: History, Technology, & Performance of Instruments of Western Music. Oxford University Press. p. 364. ISBN 978-0-19-816504-0. ^ Ratcliffe, Ronald V. (2002). Steinway. San Francisco: Chronicle Books. p. 208. ISBN 978-0-8118-3389-9. ^ Ratcliffe, Ronald V. (2002). Steinway. San Francisco: Chronicle Books. p. 205. ISBN 978-0-8118-3389-9. ^ Church, Michael (July 23, 2007). "Lang Lang: The people's pianist". The Independent. Retrieved January 8, 2016. ^ a b c "TROY professor named as official Steinway & Sons Artist". Trojan News Center. Troy University. February 13, 2015. Retrieved January 8, 2016. ^ Loesser, Arthur (1954). Men, Women and Pianos: A social History. University of California. p. 515. ISBN 978-0-486-26543-8. ^ Lieberman, Richard K. (1995). Steinway & Sons. New Haven, Connecticut: Yale University Press. p. 58. ISBN 978-0-300-06364-6. ^ a b Ratcliffe, Ronald V. (2002). Steinway. San Francisco: Chronicle Books. p. 44. ISBN 978-0-8118-3389-9. ^ Lieberman, Richard K. (1995). Steinway & Sons. New Haven, Connecticut: Yale University Press. p. 113. ISBN 978-0-300-06364-6. ^ Corsten, Volker (May 10, 2017). "Während er da so steht, gewinnt er noch an Wert" (in German). Iconist – Die Welt. Retrieved August 9, 2017. ^ "Piano manufacturers – Making the sound of music". The Economist. The Economist Newspaper Limited. 367 (8327–8330): 78. June 7, 2003. ^ a b Wilson, Cynthia (2011). Always Something New to Discover: Menahem Pressler and the Beaux Arts Trio. Paragon Publishing. p. 183. ISBN 978-1-908341-25-9. ^ Ratcliffe, Ronald V. (2002). Steinway. San Francisco: Chronicle Books. pp. 201, 203, 205, and 206. ISBN 978-0-8118-3389-9. ^ a b Giordano, Sr., Nicholas J. (2010). Physics of the Piano. Oxford, United Kingdom: Oxford University Press. p. 146. ISBN 978-0-19-954602-2. ^ Ratcliffe, Ronald V. (2002). Steinway. San Francisco: Chronicle Books. pp. 202, 204, 205, and 208. ISBN 978-0-8118-3389-9. ^ a b c d e f "MUSIC; Piano Versus Piano". The New York Times. May 9, 2004. Retrieved February 4, 2015. ^ Schnabel, Artur (1988). My Life and Music. Dover Publications and Colin Smythe. pp. 84 and 111. ISBN 0-486-25571-9. ^ Ward, Brendan (2013). "24: Revealing the piano's full set of teeths". The Beethoven Obsession. University of New South Wales Press. ISBN 978-1-74223-395-6. ^ Ratcliffe, Ronald V. (2002). Steinway. San Francisco: Chronicle Books. p. 42. ISBN 978-0-8118-3389-9. ^ Lieberman, Richard K. (1995). Steinway & Sons. New Haven, Connecticut: Yale University Press. pp. 294–295. ISBN 978-0-300-06364-6. ^ Ratcliffe, Ronald V. (2002). Steinway. San Francisco: Chronicle Books. p. 133. ISBN 978-0-8118-3389-9. ^ Fine, Larry (2013). Acoustic & Digital Piano Buyer – Spring 2013. Brookside Press LLC. p. 90. ISBN 978-1-929145-36-2. ^ Fine, Larry (2013). Acoustic & Digital Piano Buyer – Spring 2013. Brookside Press LLC. p. 91. ISBN 978-1-929145-36-2. ^ "Oberlin and Steinway: A 122-Year Partnership". Oberlin Conservatory News. Fall 1999. Retrieved February 1, 2015. ^ "A Major Gift to the Oberlin Conservatory of Music Supports the Purchase of the Renowned School's 200th Steinway Piano". Oberlin College. March 21, 2007. Retrieved January 12, 2016. ^ a b Zipp, Yvonne (March 26, 2013). "Western Michigan University becomes first All-Steinway Music School in Michigan". MLive, Kalamazoo Gazette. Retrieved January 12, 2016. ^ "Musical Instruments". Curtis Institute of Music. Retrieved January 12, 2016. ^ Savage, Adam (August 11, 2011). "University of Wolverhampton given All-Steinway School status". Musical Instrument Professional. Retrieved January 12, 2016. ^ "MTSU School of Music's 'All-Steinway' Status Gets Attention in 10th Year". WMOT. Retrieved January 12, 2016. ^ Loiacono, Frank (July 20, 2008). "SBU Art Dept. Aims To Step In-Line-Way With Steinway". The Stony Brook Press. Retrieved January 12, 2016. ^ Teichner, Martha (September 20, 2009). "A Grand Plan for Pianos". CBS. Retrieved January 12, 2016. ^ Haurwitz, Ralph K.M. (November 22, 2017). "How Huston-Tillotson got 15 pianos thanks to 'a special human being'". Austin American-Statesman. Retrieved November 29, 2017. ^ Ratcliffe, Ronald V. (2002). Steinway. San Francisco: Chronicle Books. p. 190. ISBN 978-0-8118-3389-9. ^ Lieberman, Richard K. (1995). Steinway & Sons. New Haven, Connecticut: Yale University Press. p. 53. ISBN 978-0-300-06364-6. ^ Hoover, Cynthia Adams (1981). "The Steinways and Their Pianos in the Nineteenth Century". Journal of the American Musical Instrument Society. Shreveport, Louisiana: American Musical Instrument Society. 7: 51. ISSN 0362-3300. ^ Barron, James (2006). Piano: The Making of a Steinway Concert Grand. New York: Holt. p. 100. ISBN 978-0-8050-7878-7. ^ Fostle, Donald W. (1995). The Steinway Saga: An American Dynasty. New York: Scribner. p. 55. ISBN 978-0-684-19318-2. ^ Ratcliffe, Ronald V. (2002). Steinway. San Francisco: Chronicle Books. pp. 67–68. ISBN 978-0-8118-3389-9. ^ Barron, James (2006). Piano: The Making of a Steinway Concert Grand. New York: Holt. pp. 108–109. ISBN 978-0-8050-7878-7. ^ "National Humanities Medal – Transcript from Award Ceremony". Monuments Men Foundation. Retrieved February 12, 2015. ^ "Arabesque Limited Edition by Dakota Jackson". Red Dot. Retrieved February 2, 2015. ^ a b c d e f Ratcliffe, Ronald V. (2002). Steinway. San Francisco: Chronicle Books. p. 198. ISBN 978-0-8118-3389-9. ^ Kehl, Roy F.; Kirkland, David R. (2011). The Official Guide to Steinway Pianos. United States: Amadeus Press. p. 134. ISBN 978-1-57467-198-8. ^ a b c d e Kehl, Roy F.; Kirkland, David R. (2011). The Official Guide to Steinway Pianos. United States: Amadeus Press. p. 133. ISBN 978-1-57467-198-8. ^ a b Jackson, Roland (2005). Performance Practice: A Dictionary-Guide for Musicians. Routledge, Taylor & Francis Group. p. 308. ISBN 978-0-415-94139-6. ^ Barron, James (2006). Piano: The Making of a Steinway Concert Grand. New York: Holt. p. 102. ISBN 978-0-8050-7878-7. ^ The Piano Will Never Be the Same. Smithsonian Channel. November 7, 2011. Retrieved July 8, 2016 – via official YouTube channel of Smithsonian Channel. ^ Palmieri, Robert, ed. (2003). The Piano: An Encyclopedia (2nd ed.). Routledge, Taylor & Francis Group. p. 111. ISBN 0-415-93796-5. ^ Steinway, Theodore E. (2005). People and Pianos: A Pictorial History of Steinway & Sons (3rd ed.). Pompton Plains, New Jersey: Amadeus Press. p. 68. ISBN 978-1-57467-112-4. ^ Barron, James (2006). Piano: The Making of a Steinway Concert Grand. New York: Holt. p. 105. ISBN 978-0-8050-7878-7. ^ a b Kehl, Roy F.; Kirkland, David R. (2011). The Official Guide to Steinway Pianos. United States: Amadeus Press. p. 135. ISBN 978-1-57467-198-8. ^ a b c Ratcliffe, Ronald V. (2002). Steinway. San Francisco: Chronicle Books. p. 199. ISBN 978-0-8118-3389-9. ^ Chapin, Miles (1997). 88 keys: The making of a Steinway piano. New York: Potter. p. 60. ISBN 978-0-517-70356-4. ^ Ratcliffe, Ronald V. (2002). Steinway. San Francisco: Chronicle Books. pp. 80 and 85. ISBN 978-0-8118-3389-9. ^ Kehl, Roy F.; Kirkland, David R. (2011). The Official Guide to Steinway Pianos. United States: Amadeus Press. p. 136. ISBN 978-1-57467-198-8. ^ Gill, Dominic (1981). The Book of the Piano. Phaidon Press. p. 37. ISBN 978-0-7148-2036-1. ^ Kehl, Roy F.; Kirkland, David R. (2011). The Official Guide to Steinway Pianos. United States: Amadeus Press. p. 137. ISBN 978-1-57467-198-8. ^ Ratcliffe, Ronald V. (2002). Steinway. San Francisco: Chronicle Books. p. 200. ISBN 978-0-8118-3389-9. ^ Paderewski plays Chopin (CD booklet). Pearl. Steinway grand. ^ Sergej Rachmaninov Piano Recital (CD booklet). Piano: Steinway & Sons Grand Piano. ^ "Lin-Manuel Miranda Performs at the White House Poetry Jam: 8 of 8". The White House. May 12, 2009. Archived from the original on June 29, 2016. Retrieved December 5, 2017. ^ Lin-Manuel Miranda Performs at the White House Poetry Jam: (8 of 8). The White House. May 12, 2009. Retrieved July 8, 2016 – via official YouTube channel of the White House. ^ "Harry Connick, Jr. at the White House". The White House. February 21, 2010. Archived from the original on October 22, 2012. Retrieved February 15, 2015. ^ Harry Connick, Jr. at the White House. The White House. February 21, 2010. Event occurs at 15:35. Retrieved July 8, 2016 – via official YouTube channel of the White House. Barron, James (2006). Piano: The Making of a Steinway Concert Grand. New York: Holt. ISBN 978-0-8050-7878-7. Chapin, Miles (1997). 88 keys: The making of a Steinway piano. New York: Potter. ISBN 978-0-517-70356-4. Fostle, Donald W. (1995). The Steinway Saga: An American Dynasty. New York: Scribner. ISBN 978-0-684-19318-2. Goldenberg, Susan (1996). Steinway: From glory to controversy; the family, the business, the piano. Oakville, Ontario: Mosaic Press. ISBN 978-0-88962-607-2. Hoover, Cynthia Adams (1981). "The Steinways and Their Pianos in the Nineteenth Century". Journal of the American Musical Instrument Society. Shreveport, Louisiana: American Musical Instrument Society. 7: 47–89. ISSN 0362-3300. Kehl, Roy F.; Kirkland, David R. (2011). The Official Guide to Steinway Pianos. Montclair, New Jersey: Amadeus Press. ISBN 978-1-57467-198-8. Lieberman, Richard K. (1995). Steinway & Sons. New Haven, Connecticut: Yale University Press. ISBN 978-0-300-06364-6. Matthias, Max (2006). Steinway Service Manual: Guide to the care and maintenance of a Steinway (3rd ed.). Bergkirchen, Germany: PPV-Medien/Bochinsky. ISBN 978-3-923639-15-1. Ratcliffe, Ronald V. (2002). Steinway. San Francisco: Chronicle Books. ISBN 978-0-8118-3389-9. Steinway, Theodore E. (2005). People and Pianos: A Pictorial History of Steinway & Sons (3rd ed.). Pompton Plains, New Jersey: Amadeus Press. ISBN 978-1-57467-112-4.